GN solids control is a global manufacture for solids control equipment and has the capabilities to customize the mud system. Pumps play a vital role in the mud system efficiently transferring the fluids to the process equipment. GN pumps are fabricated with robust material and precision design. Explosion proof standard motor assures the pump quality. Obviously, centrifugal pump is the most popular pump in the solids control industry. First and foremost, centrifugal pump has the capabilities to delivery drilling fluids to desander and desilter units as a feeding pump. On the other side, we could assemble the centrifugal pump with hopper to mixing the drilling fluids. We could provide the capacity from 200GPM to 1400GPM to meet with a variety of demand. Mechanical seal and iron steel impeller assure the centrifugal pump durability. GN shear pumps are widely used for oil & gas drilling industry. GN shear pump could cut off the polymers and clays in order to improve the mud properties. Impeller is particularly designed with a wider flow pass with larger flow area. Comparing with similar products, GN shear pump own 10% better function in energy-saving and efficiency. GN slurry pumps are mainly utilized for large solids content of fluids. It is made of abrasion-resistant alloy and gland seal between impeller and the main body, It is capable of transfer ring the fluids from mud pit to solids control equipment for processing. Vertical slurry pump saves much space in the jobsite. Positive displacement pump is also called screw pump which is an ideal pump to feeding mud to decanter centrifuge without agitating and shearing. The shaft of pump is made from stainless steel so it handles with oil based mud for long time running. 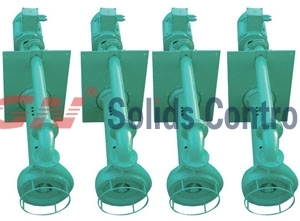 GN Solids Control provides above pumps and other solids control equipment. Please feel free to contact with us if you require solids control information.